Thua Thien Hue Province, with a history dating back over many hundred years, is well-known for various traditional craftmanship, and artworks. Paper flower handicraft in Thanh Tien Village is the most distinctive among them, bringing about a special feeling for any travellers. For many years, Thanh Tien Village has been referred as one the most favourite destinations highly rich in local culture, local belief and traditions. It is situated in Phu Mau Ward, Phu Vang District, Thua Thien Hue Province. Lying along the southern side of Huong River in the lower part of Sinh tributary, this village is setting against the scenic greenery with amicable and traquil beauty; therefore, it will offer many interesting options to discover different cultural and local religious facets of Hue through the visual colorful manifestation of paper flowers. The paper flowers here is not only limited within the purpose in aesthetics, and decoration, but also for the local religious rituals and etiquettes. 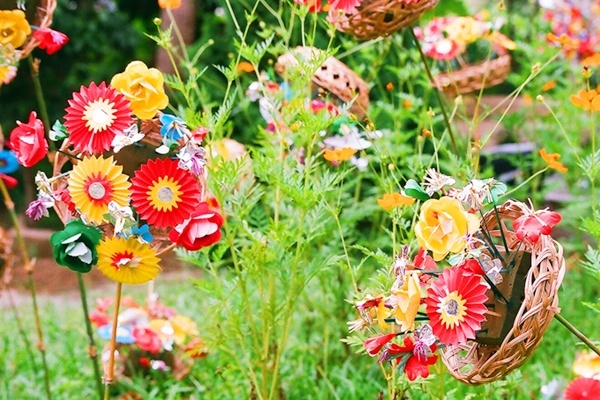 Originally, the paper flower traditional handicraft in Thanh Tien Village began due to the religious reason. It was dated back approxiamtely 400 years ago when the local worship practice, and belief required specific ritual items, in which paper flowers was among these important objects. Ancestor veneration, and local folk religion has always played a significant role in the spiritualism of Hue residents. Incense, flower, lamps, and fruits are among the important ritual objects. However, the harsh and unpleasant weather conditions, heavy rainfall, as well as extreme sunlight in Hue, to some extent, have made it difficult for fresh flowers to grow throughout the year. Therefore, paper flower has come as an alternative solution which is cheap and durable for praying activities of the local people. They have been formally put in the local religious places, and eventually, have become an iconic ritual objects in the local worship of the adjacent provinces Danang, and Quang Tri, and other further regions where many Hue local people have dwelt, and still kept their faith, particularly on the arrival of Lunar New Year. By the time passing, the paper flowers have prevailed in different places, particularly the middle region of the Central Vietnam. 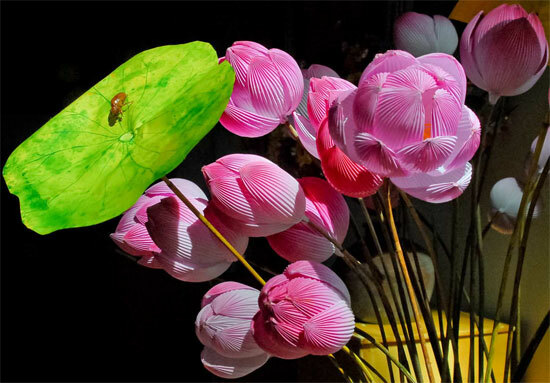 If you pay a visit to Thanh Tien Village, you will both have a chance to observe the traditions of paper flower craftmanship, and discover various distinct facets of Hue culure, and local belief in a lovely and engaging place. Ho Thuy Tien lies just outside Huong Thuy town in Hue and has become somewhat of a rite of passage for travellers on the banana pancake trail. Visitors can access the park fairly easily and explore the cracked water slides, partially full aquarium tanks and the increasing creep of nature over the pathways and structures. Princess Ngoc Son’s house of worship is a well-known garden house in Hue Citadel. It is an independent area in ancient Gia Hoi landscape, East of Hue’s imperial city. Lac Tinh Vien by Hong Khang poets founded in 1889 on land plot with an area of 2.070 m2 in ancient Duong Xuan village, Lac Tinh Vien campus pretty cool. The road leading to the home side's two hibiscus flowers, and the roses, laurel, your word,... planted symmetrically. Under the tree a small set of tables and chairs to sit and watch the scene, drinking tea. Located halfway up the Cham mountain in the suburbs of Hue, Huyen Khong Son Thuong Pagoda is well known throughout the region for its romantic and heavenly scenery. The tranquil setting of this spiritual getaway is a magnet for those seeking a peaceful alternative to the city and is especially attractive to literature and art enthusiasts. Le Ba Dang is a Vietnamese-born painter who was listed as one of the most valuable academics of the 20th century by the International Biography Centre at Cambridge University. Diem Phung Thi is a published Vietnamese sculptress who was a member of the European Academy of Sciences and Arts and listed in the Larousse Dictionary of Twentieth Century History.